Oops! That was the recently endorsed Liberal candidate for Brindabella Mark Parton tweeting to former ACT ALP Branch secretary Elias Hallaj on May 19, 2014. In those days Parto’s claim to political fame was as an unelected independent candidate from the 2008 ACT election. But he tweeted on rather prophetically: “I note that U fave any left leaning tweets of mine. I’m assuming if I was ever back in ring again they’d be back to haunt me.” Too right, comrade. AS ClubsNSW used the slogan “Won’t work. 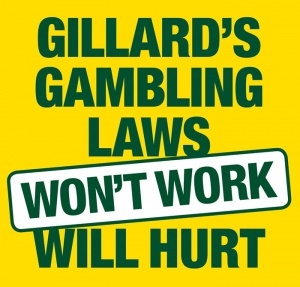 Will hurt” to resist the Gillard Labor government’s attack on pokies in 2011, it is curious to see the Labor-friendly UnionsACT unimaginatively recycling the very same slogan to attack the Canberra Liberals on jobs for the forthcoming ACT election. Imitation, as they say, is the highest form of flattery. THOSE strident critics of Labor’s tram plans, the Canberra Public Transport Alliance, have discovered they have a problem getting the message through. “Most voters are going about their business and don’t have too much time to think deeply about politics and many avoid anything that smells like politics. They do a disservice to themselves and the rest of us by not investigating further,” bemoans spokesman Russ Morison. So how to get the bad-tram message across to diffident plebs? Corflute roadside signage, of course. Only problem is they have no dough for the stakes let alone the signs and are calling for donations. 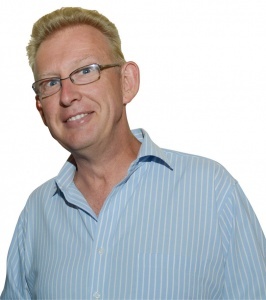 “Our messages need to be short and sharp and not offensive, and above all strategically located,” says Russ. 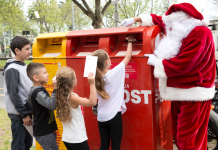 ALSO on the anti-tram platform, but with enough funds to run to postcards, Deputy Opposition Leader and aspiring member for Yerrabi, Alastair Coe, has been busily letterboxing in tram-pampered Gungahlin a flyer that says the cost of operating one tram is equal to 28 buses. Given that only three per cent of Canberrans live within walking distance of a proposed light rail stop, Coe says we’re still going to depend on cars, buses and bicycles. “RESORT-style living and completely off the grid with no water restrictions, no power bills thanks to your own standalone power system and a totally solar passive design,” trills the real estate agent’s blurb. And all you need to be “off the grid” and free of those troublesome quarterly bills is a lazy $3.6 million and a love of country living. All that and a house with three living zones including 6 bedrooms plus separate guest accommodation, a double size chef’s kitchen and two butler’s pantries. More drooling at millpost.net. Chris Churchill (0417 080460) is the agent. Tell him CC sent you!